Flight begins in a nosedive. Its parallel narrative in the opening act, the very on-the-nose method of establishing its central character’s addiction, Denzel Washington’s ultra-suave method of playing a functioning alcoholic, and Kelly’s Reilly’s character conceits all came together as a conglomeration of half-fulfilled ideas. Then Flight’s special effects centerpiece is on display – an incredibly visceral depiction of a catastrophic airplane crash. As if in sync, the plane and picture begin to level, instead venturing into a much more detailed chronicle of a booze hound. Ascending into a character study on the nature of addiction, Flight places several thematic under its wounded wing – from an existential journey of a man contending with alcoholism whilst developing an ethical code, the picture plunges glimpses of romance, familial drama, and courtroom procedural. All of these aspects could have floundered, but under Robert Zemeckis’ control and Washington’s central performance, Flight excels. Flight adheres to a classical Hollywood mold without the slightest effort. While other films may attempt to emulate a specific type of stylistic tendency found in classic Hollywood cinema, Flight (and to toss another example, Steven Soderbergh’s Magic Mike) adopt traditional narrative devices and simply allow their films to flourish without restraint. 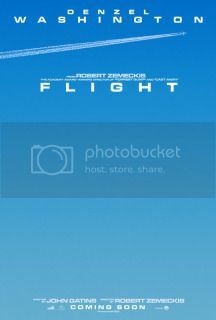 Whereas other filmmakers make conscious attempts to nudge their films toward emulation, Flight excels for being a classical example of narrative filmmaking. The sobering reality that Washington, Zemeckis, and writer John Gatins convey through Flight registers on the same level of fright as Ray Milland’s work in Billy Wilder’s The Lost Weekend. With that film, desperation is littered throughout virtually every facet of its design. But the scope in which Flight operates is far broader – life and death are at play, which therein introduces larger questions of spirituality. The added dimensions to Flight, whereupon addiction is layered atop an ethical crisis that deals with various dimensions of religiosity and familial responsibility produces one of the densest mainstream pictures of the year. Provided that spirituality is a key element to Flight, it only makes sense that redemption enters the thematic airspace. While some critical dismissal has been placed on the film for its conclusion, I can’t help but feel that people are missing the point of the entire picture when acknowledging the ending. While it possesses a measure of redemption, the underlying current that is implied through the disarray of addiction is that it serves to haze one’s identity. Like the clouds that Washington’s character navigates through, much of his own life has been clouded in a trajectory of misdeeds and addiction. Just referring back to the film, piecing together the rich visual imagery with its dense thematic material, sparks my appreciation for this sort of traditional filmmaking. Initial reservations from the film’s opening act were dispelled 20 minutes into the picture, as Flight becomes one of the many fine examples of what mainstream Hollywood distributors are capable of putting out these days.